English teaching is no longer just four walls, some desks and a black board. It’s fluid; it’s in our laps, on our screens and in the palms of our hands. It goes wherever we want to go, and takes us wherever we need it to. Read on for information and download our free Teaching English Online E-Guide. With the incredible advances in technology and communication, more and more ESL teachers are making the leap from classroom to computer screen. Online English teaching is a rapidly growing industry – and is convenient for both teacher, and student. For students, it means learning without leaving the lounge room or office, and for teachers, it can mean location independence; joining the ever-growing ranks of ‘digital nomads’ around the world. Sure, this isn’t the first we’ve heard of online teaching. ESL via video chat has already been around as long as webcams, traditionally as a way for teachers to supplement their income from the comfort of their homes. But, with the increasing accessibility of online business, online teaching can become an English teacher’s whole income – not just some extra cash on the side. How to start? Well, first you’ll need some know-how. Beyond the required training it takes to become a good English teacher, you’ve got to have a good grasp on the tools. 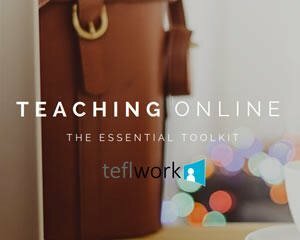 TEFLwork’s free e-guide, Teaching Online: The Essential Toolkit, runs you through all the best tools to get started and grow your business, and techniques to use to find new students. You’ll learn how to engage your students with the best web teaching platforms, keep organised, earn money, and get your name out there as a reputable English teaching professional.